Karl Lagerfeld’s Commentary on the Queen’s Jubilee!!! 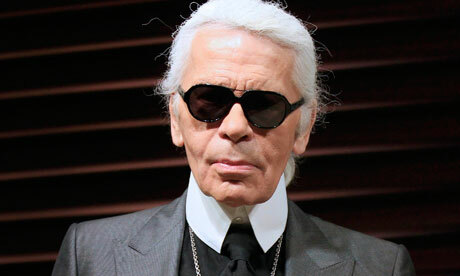 Karl Lagerfeld will be a fashion commentator on the France 2 network live during Queen Elizabeth’s jubilee this June…..Lagerfeld previously commentated on William and Kate’s wedding last year for the same network…. I loved it … Though his comments were sometimes a bit rude, they were really funny!! !…..For example, when he saw Princess Beatrice he said “Where did she find that hat, in a bin? It’s atrocious,” and I remember him saying “It looks like she’s wearing a sofa on her back!’ on another attendee’s tapestry coat!! !…I guess it’s more acceptable when old people say stuff like that? … In any case, he was more entertaining than any other commentator that day!!! Carine Roitfeld and Karl Lagerfeld are collaborating on an upcoming book… A preview and a few details about the collaboration is in the November issue of V magazine. The project, which is still being produced, revolves around the classic black Chanel tweed jacket. Lagerfeld has been shooting while Roitfeld has been styling a number of stylish women and men of different fields of life in order to show the many different ways this legendary jacket can be worn…… “This jacket is a vital and irrational impulse open to creativity and transformation,” Lagerfeld explains, adding “Especially in the hands of Carine Roitfeld”….. Can’t wait for the book to come out!….Here are 3 of my favorite images so far! The Swedish glassware company Orrefors collaborated with designer Karl Lagerfeld to make these beautiful ,clean and elegant pieces……love them. 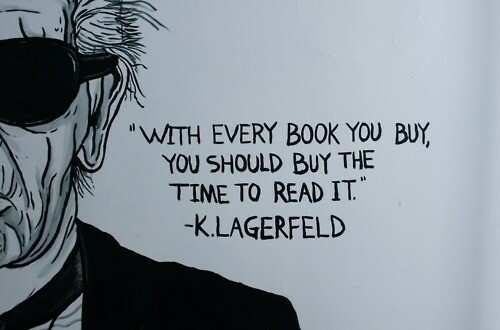 Besides fashion, Karl Lagerfeld is known to be a true book lover. 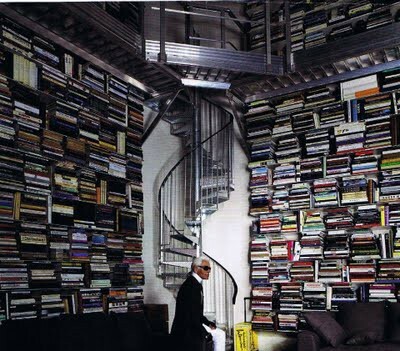 It is said that he owns an impressive library that contains around 300 000 books… ( trust me I did not add an extra zero here!). He is so passionate about his books that he is calling his new fragrance Paper Passion. He also has his own book publishing company, Edition 7L, and runs his own bookstore, 7L, on the Rue Lille in Paris. Combining his two passions in life, designing and reading. But this is not what I want to talk about today ! 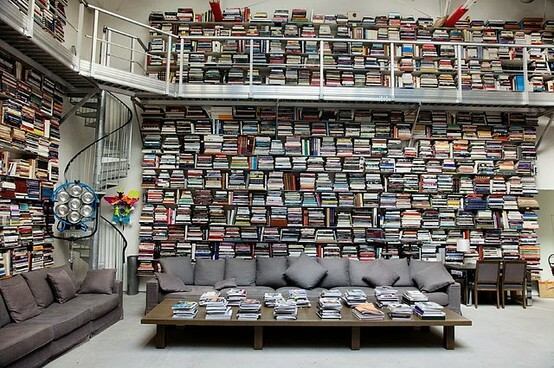 The main reason for this post is the designer’s Paris home or more precisely the walls of books in his Paris home …..Would you just look at that? Its like I have died and gone to book heaven! This is my dream family room! ….. Ahhhh to be surrounded by books … lots and lots of books all the time?….. Heaven! I thought that my Husband and I had quite a book collection until I saw these photos … he certainly put our collection to shame lol . Most of his books are about art….. I would just do anything to go and look through his art books, and design books…. and….. All of his books! 1st of all I would child proof the whole room…. even though I like the staircase it is an accident waiting to happen. I would make the place a bit more friendly and inviting so that my kids would enjoy being there and get encouraged to read. I like the coffee table so I wouldn’t change that…. But I would never ever allow anyone to stand on IT !….. I mean what were you thinking Karl ? Whose great idea was that?….Let me guess! its yours!